Published Apr 5, 2016 by Pearson IT Certification. Part of the LiveLessons series. More than 5 hours of video training detailing common exam traps, pitfalls, and difficulties on the CCNP ROUTE 300-101 exam. The author also walks you through a series of sample exam questions so you can experience what it’s like to take the test before you ever walk into the testing facility. 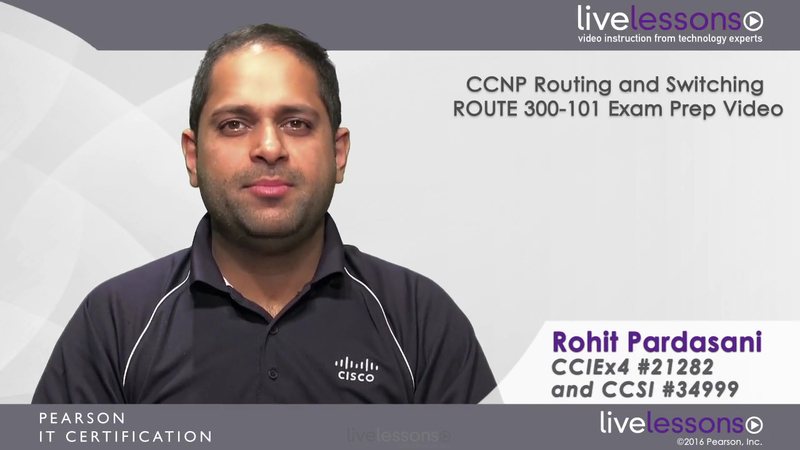 CCNP Routing and Switching ROUTE 300-101 Exam Prep Video contains more than 5 hours of deep-dive training on common CCNP ROUTE exam traps, pitfalls, and difficulties. Expert instructor and multiple CCIE Rohit Pardasani details the most common mistakes people make when taking the CCNP ROUTE exam, so you can avoid them in the testing facility. The first part of this video course addresses common issues that candidates face when preparing for the exam, including an overview of the exam itself and helpful advice when taking the exam. The second part of the course covers common pitfalls associated with the exam, including coverage of OSPF, EIGRP, DMVPN, and redistribution. The last part of the course breaks down the exam into the common question types, presenting example questions of each type and walking through strategies for how to attack each type of question. Each of these exam review sections concludes with live Q&A sessions with the author. CCNP Routing and Switching ROUTE 300-101 Exam Prep Video contains more than 80 individual video lessons for a total of more than 5 hours of instruction. LiveLessons Video Training series publishes hundreds of hands-on, expert-led video tutorials covering a wide selection of technology topics designed to teach you the skills you need to succeed. This professional and personal technology video series features world-leading author instructors published by your trusted technology brands: Addison-Wesley, Cisco Press, IBM Press, Pearson IT Certification, Prentice Hall, Sams, and Que. Topics include IT Certification, Programming, Web Development, Mobile Development, Home and Office Technologies, Business and Management, and more. View all LiveLessons on Pearson IT Certification at http://www.pearsonitcertification.com/livelessons. Lesson 2.4: How Many Simulations Will There Be? Lesson 2.5: What Topics Should I Study?